I have always liked Salcombe. With its combination of strong nautical tradition and rural South Devon charm, it’s pretty much perfect in my book. 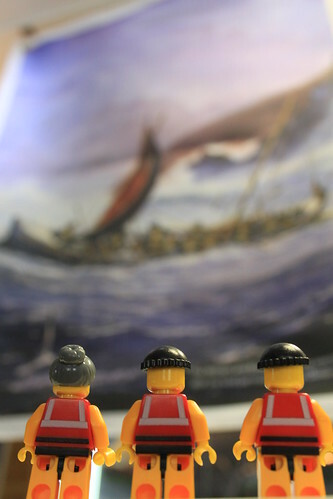 So when Matt, Salcombe RNLI crew member and volunteer press officer, got in touch to ask if the little guys and I would like to come down for a tour of the station, we couldn’t say yes quickly enough. Which is how, one Saturday morning, Natalie, Molly (our Labrador), the little guys and I found ourselves staring up at the brick façade of one of the loveliest lifeboat stations I have ever seen. We’d arranged to meet Matt at midday and, on the dot, a small scooter whizzed around the corner. On it was a large, grinning figure wearing a helmet. The tiny windscreen of the scooter sported the RNLI flag and the words ‘Lifeboat Crew’. “I guess that’ll be him, then,” observed Natalie dryly. Indeed, it was. And as Matt walked us up to the station’s crew room, he told us why he had eschewed the traditional Land Rover for something more zippy. As anyone who has been there will know, traffic in Salcombe, especially in Summer, can be a bit of a nightmare. Tiny one-way streets and bumbling tourists driving chunky SUVs conspire, Matt explained, against the lifeboat crew member racing for a shout. So several of the crew have got themselves scooters like his, so they can skirt the crowds and get to the station as quickly as possible. They head off in one or both of the station’s lifeboats, leaving a little row of shiny scooters parked up outside. 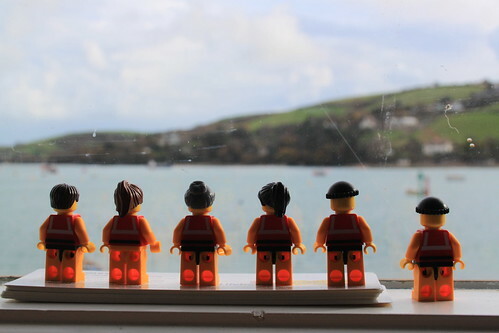 Up in the crew room, the little guys flocked instantly to the superb view across the harbour. 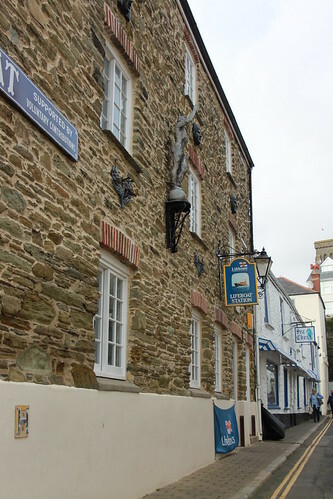 Salcombe is situated on a ‘ria’, which is a drowned valley flooded by rising sea levels. It’s not technically an estuary, as it doesn’t have a large river flowing into it; just a few small streams that are dwarfed by the size of the ria itself. And it is, I can attest, a truly great place for watersports of all kinds. While Matt put the kettle on, he told us about the station. There has been a lifeboat station in Salcombe since 1869, though the current station building was opened in 1992. The station has two lifeboats: the 16-metre Tamar class all-weather lifeboat ‘Baltic Exchange III’ and the smaller Atlantic 75 class inshore lifeboat ‘Joan Bate’. The Tamar lies afloat at her own pontoon, while the Atlantic is housed in a boathouse adjoining the main station building. 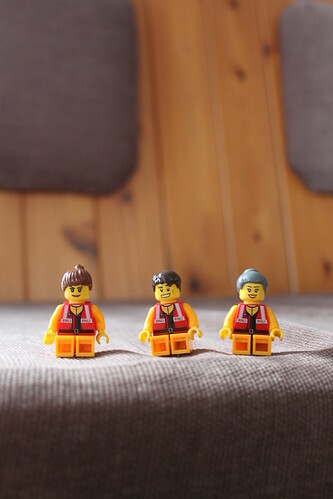 Being the Crew that they are, the little guys couldn’t help having a poke around the crew room. 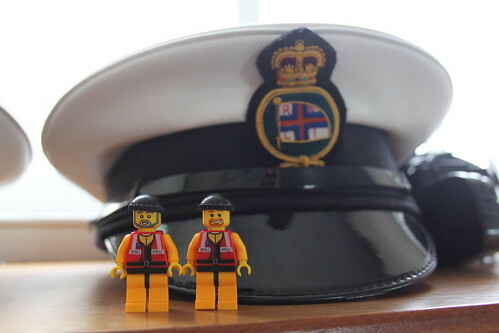 Coxswain Bob and Mechanic Dave were particularly taken with the RNLI hats. So much better than their own woolly ones, they thought. But perhaps a little on the big side. 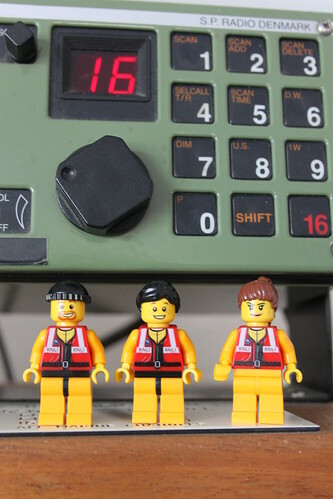 Having recently done their VHF training, the Crew were also extremely interested in the station’s own radio set. They listened intently on Channel 16, but thankfully all was well. After we’d finished our tea, Matt took us downstairs to the station’s shop and museum. It was clear that he was very proud of it and, having had a chance to look around, we could see why. Full of stories, pictures, artefacts and souvenirs from the station’s long and distinguished history, the museum kept the crew engaged for ages. Oh, and there are bears, too. The Crew also learned about one of the sadder times in the station’s history, which has become known as the Salcombe lifeboat disaster. On 27th October 1916, the lifeboat ‘William and Emma’ was launched in a furious gale to help the schooner ‘Western Lass’, which had been driven ashore outside the harbour entrance. By the time the crew had rowed (yes, rowed) to the wreck, the schooner’s crew had been brought ashore by the coastguard. The lifeboat turned for home but, approaching the safety of the harbour, capsized near the notoriously treacherous bar that lurks across the entrance. Tragically, thirteen of the fifteen crew drowned. 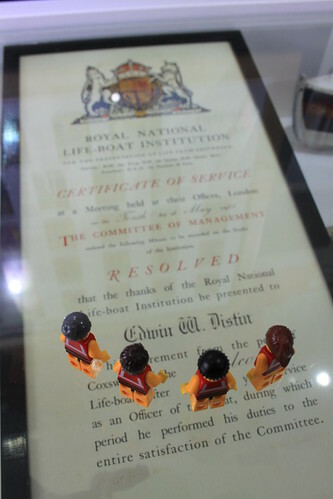 The station was closed briefly but reopened with a new lifeboat and a new crew just six months later. One of the survivors of the disaster, Eddie Distin, became the Coxswain of the crew. 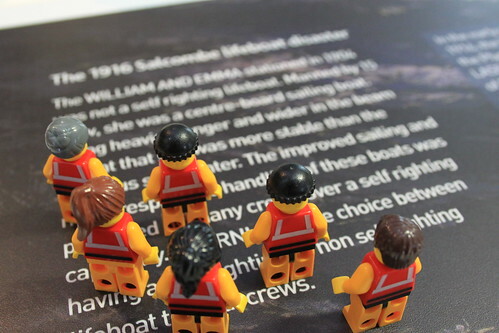 The Crew read more about the Salcombe lifeboat disaster. Matt explained that, with the centenary of the Salcombe lifeboat disaster approaching, the station is keen to commemorate it in some way. The little guys were a bit short on ideas, but we promised to see if we could think of anything. So if you, dear reader, have any ideas for a fitting commemoration, then I’m sure the station would be delighted to hear from you. You can find their contact details here. The Salcombe lifeboat crew itself numbers twenty five, two of whom are full-time employees and the rest of whom are volunteers. And they are supported by a veritable army of shore crew and other volunteers, all of whom play a vital role in keeping the station’s lifeboats ready to set out to sea at a moment’s notice. Here’s the Crew in front of, well, the crew. The Salcombe crew appears to have served with particular distinction, having been awarded several medals for gallantry and other accolades over the years. Many of these, together with the stories behind them, are on display in the station’s museum. Much to the delight of the little guys. In the corner of the museum, a video presentation about the station was playing on a loop. 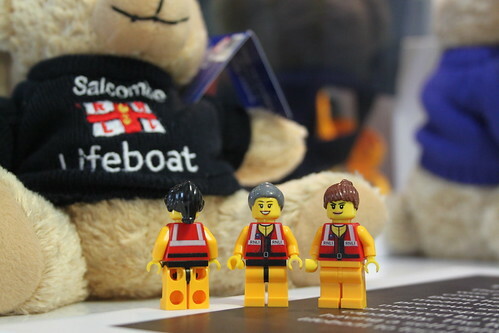 It showed some stunning aerial photography of the Salcombe lifeboats and talked about the work of the RNLI and its crews. At one point, it showed a pager going off, with the resulting ‘beep beep beep’ echoing around the room. The first time we heard it, Matt jumped and grabbed automatically at his own pager on his belt. He glanced down at the pager, then relaxed and looked up sheepishly. “Gets me every time,” he said. 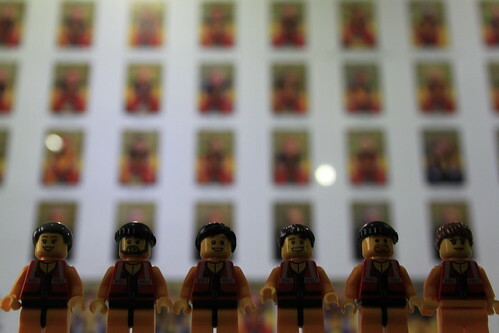 * These brave crew members are now commemorated on the RNLI Memorial in Poole. There is also a list of the names inscribed on the memorial online here. To get an idea of the sacrifice that our communities around the coast have made in attempting to save others from the sea, look at the entry for Longhope in 1969. Read the surnames.